History: 50 year old male with self inflicted chest stab wound. 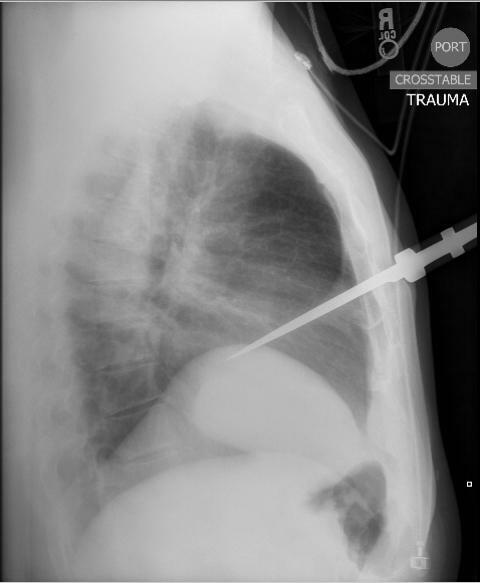 Penetrating Chest Trauma: Lateral radiograph of the chest shows a knife entering the anterior thorax. It is difficult to further ascertain the position with only the lateral view. 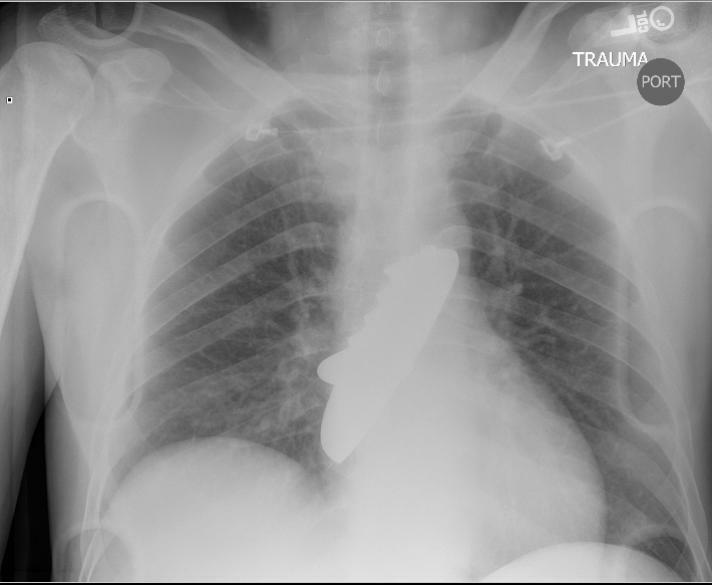 Penetrating Chest Trauma: Frontal radiograph of the chest shows the knife enters the right hemithorax. The right hemidiaphragm is elevated. Important findings to look for in the case of penetrating trauma to the chest include pneumothorax, pleural effusion (which indicates hemothorax), widened mediastinum indicating injury to the vascular pedicle, enlarged cardiac silhouette indicating hemopericardium, diaphragmatic injury, and pneumoperitoneum. Surprisingly, this patient did not have pneumothorax, pleural effusion, or an enlarged cardiac silhouette; however, the frontal radiograph is in the supine position, limiting the evaluation for pneumothorax. In the end, the patient lived with only minor injury to his lung and chest wall, and the right hemidiaphragm was not injured.